A plan to remove contaminated soil from a Superfund site on the Leech Lake Reservation is on hold. The Environmental Protection Agency had proposed that soil be excavated from the St. Regis site this fall. The soil is polluted with cancer-causing chemicals left behind by a wood treatment plant that operated in Cass Lake for 30 years. But recent winter weather put a hault to the plan. And EPA officials now say there's another snag. The EPA has been unable to reach consensus with local governments on a soil removal strategy. That could delay soil excavation for up to two years. Cass Lake, Minn. — The St. Regis site near downtown Cass Lake has been on the federal government's Superfund list since 1984. Results from the latest round of soil testing this summer show the site still contains dangerous levels of dioxins. 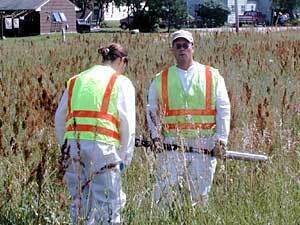 Cass Lake residents had expected the worst of the polluted soils would be hauled away this month. But that's not going to happen. The EPA's Sonia Vega says, instead, portions of the contaminated land will be fenced off. "At a minimum, the areas that are owned by the city, because we have access to them, will be covered and fenced this year," says Vega. "What is going to happen after that, when the weather changes back into spring, is still under discussion." International Paper Co. now owns the old wood treatment site and is responsible for the cleanup. Vega says the company had agreed to a soil removal plan. But local governments also have a say in how the site is cleaned. Vega says one of those government agencies opposes immediate soil removal. Instead, they propose waiting until more testing is completed, which could take up to two years. In the meantime, the government entity proposes covering the contamination with fabric and surrounding it with a semi-permanent fence. EPA officials hope to reach concensus with all of the involved parties before spring. ... You can't even go out and mow your lawn. What kind of life is that? You're essentially in jail in your own home. Meanwhile, some Cass Lake residents are losing patience with the cleanup process. More than 40 people still live within the Superfund boundaries. Pat Anderson grew up in that neighborhood, and her mother still lives there. Anderson says her mom is scared to touch the soil in her yard. She keeps her windows closed because she worries about contaminated dust. But Anderson says her mother can't afford to move. "She's stuck," says Anderson. "And who's she going to sell her home to if she wanted to move? Who's going to come and buy, if you can't even go out and mow your lawn? What kind of life is that? You're essentially in jail in your own home." Pat Anderson has suffered two bouts with cancer. So has her sister. Anderson is convinced her family's health problems are a result of the St. Regis pollution. She says local residents should accept no less than full evacuation of people still living there. "I think they ought to go over there and make International Paper buy everyone out, and move them out, period, and get them out of there," Anderson says. "They've been screwing around for 20 years, and nothing has been solved." EPA officials say it's unlikely residents will be relocated. The latest round of soil testing shows dioxin levels on residential properties are below the EPA health standard of 1,000 parts per trillion. But there's disagreement over whether that's an acceptable standard. Officials with the Minnesota Department of Health say the EPA's standard is based on outdated science. The state released a report last week that uses a standard of 50 parts per trillion. Several residential properties tested above that mark. Rita Messing, a toxicologist with the Department of Health, says the soil contamination presents an ongoing danger. "If people are exposed in sufficient quantities, it could result in increased risk of things like cancer, possible birth defects, possibly other problems like neurological problems, or immune system problems," says Messing. Federal law says the EPA can apply a more stringent health standard once the agency completes a health risk assessment of the community. The assessment includes more soil, water, and fish tissue testing this spring.